Your EZStub services have been upgraded! Even though EZStub.com has been retired as of November 1, 2016 you are still able to to access your pay stubs through Doculivery, a new website. Please contact your employer to obtain the new link for your new pay stub site. Online pay stubs provides employees secure access to current and past pay information with 24/7 online availability. Email delivery, and text messaging notifications options are standard, and may be customized to personal preferences. Employees with smart phones and other mobile devices may also connect and view their electronic pay stubs quickly and easily. NatPay's online pay stubs provide much more security over storing paper stubs for future reference because others can see them, they can be lost, or left where others might take them. Paper stubs are usually passed through many hands in the process of delivering them to employees. Online pay stubs are only seen by the employee who has password-protected access. Security is assured through many checks and balances so sensitive data remains safe and secure at all times. Our unique and proprietary 3 tier server systems guarantee that all data is safe and secure. Online pay stubs information is never cached in computer memory. All data is cleared upon log-off, which allows for secure data access at airports, hotels, or with any public Internet connection. SSL (secure socket layer) encryption, GEOTrust™ certificates, and firewall protection. Online pay stubs suppresses information such as SSN, home addresses and bank account numbers to eliminate the chance of identity theft. Payroll administrators save time and effort because employees are able to obtain current and past pay stub information on their own with online pay stub self-serve features. Payroll administrators will have more time to do the important things they need to be doing rather than wasting precious time performing repetitive tasks. Payroll administrators and employees alike also benefit from the robust online pay stub messaging feature. Just imagine having payroll deduction information or important announcements sent right alongside employees' pay stubs. Send messages quickly and easily to particular groups or to everyone! 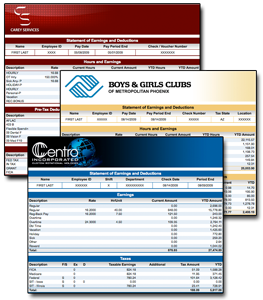 Pay stubs look great online! Contact us today for a free demo and see them in action!